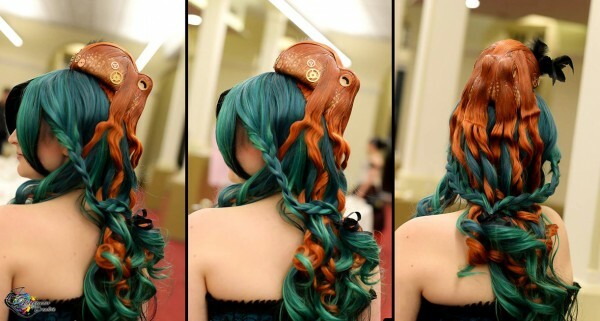 How to Make Octopus Hair « Adafruit Industries – Makers, hackers, artists, designers and engineers! 1. The piece isn’t completely made of hair. There is a foam shape at the core. In this case I used a Styrofoam sphere that I hollowed out on one side to create the bulbous part of the body. I used expanding foam that I then carved to create the eye and upper-leg portion. 3. Start adding wefts! Ok, so I separated my wefts into sections 4-5 inches wide, folded the sewn part over itself so it’s three layers thick and glued the sewn end together with hot glue. I then used hot glue to attach this part to the underside of the foam shape (where I had carved the Styrofoam out). The hair is stretched over the felt-covered shape and secured down with some tacky glue. You can dilute this if your’s is very thick. I used pins and bobby-pins to hold the hair in shape while it dried. Be prepared for this to take several days, allowing sections to dry overnight. You can see all of the steps in the below image and read more details over at DeviantArt.